Take a break from the hustle and bustle of the city on a 5-day hike through Torres del Paine National Park, and discover scenic landmarks including Nordenskjöld Lake, the French Valley, and the Grey Glacier. Explore at a pace that suits you on an independent trek, and avoid hidden costs with meals and accommodation included as per itinerary, with a choice of single, double, or dorm packages available. Pre-Departure Briefing: Travellers must go to the providers' office in Puerto Natales one day before the start of the programme at 18:00 for a briefing. There you will receive a welcome kit/voucher and program information. IMPORTANT INFO: In Chile there is a 'Foreign franchise' (Chilean Law) to improve tourism, where tourists are exempted of paying the tax of 19% at the check in, so please do not forget to bring the ORIGINALS of your Passport and Tourist card (given at the border when entering to Chile). If you do not carry and present these documents you will have to pay the tax in Chilean pesos at the check in. 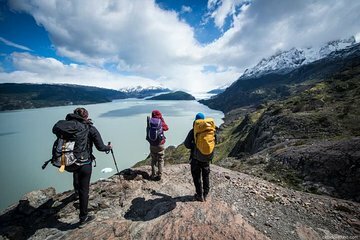 Patagonia has an unpredictable weather, that’s why we recommends you to bring: 40 litres Backpack, 20-25 litres Backpack for day hikes, Waterproof jacket and trousers (GORE TEX), Warm clothes (Polar Tec), Comfortable trousers for trekking, T-shirts, Long sleeve shirts, Trekking boots, Sandals (for showering, resting and crossing streams), Flashlight, Earplugs, Sunglasses, Towel, Enough battery supplies for the whole trek (there are no places to charge batteries), Padlock, Warm hat, Sun hat, Gloves, Sunscreen, Camera (with charger, memory cards and waterproof bag), Binoculars, Water bottle (Nalgene), Ziploc bags (for taking your trash back), Trekking Poles. Note: Guests must go to the office in Puerto Natales at 18:00 one day before the start of the program for a briefing. There, guests will receive kit/voucher and program information. For environmental purposes, in some of the Refugios, the electricity is turned off during the night, between 23.00 PM and 07.00 AM. The use of certain electronic devices is not possible due to the fact that they may overcharge our systems (example: hairdryers). Please bring enough batteries. Concerning connectivity: The National Park and the Lodges don't have cellphone or Internet connectivity due to its remote location. GPS devices work properly all over the Torres del Paine National Park.